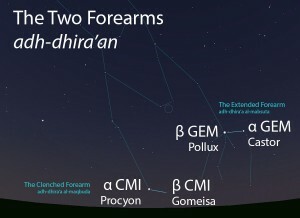 The Two Forearms are part of the Arabian megaconstellation of the Lion (al-asad). At some point, the Two Forearms were differentiated by the Arabs as the Clenched Forearm (adh-dhira’ al-maqbuda) and the Extended Forearm (adh-dhira’ al-mabsuta). The Clenched Forearm was the first pair to set and included the star that designated the Little Bleary-Eyed One (ash-shi’ra al-ghumaysa’). 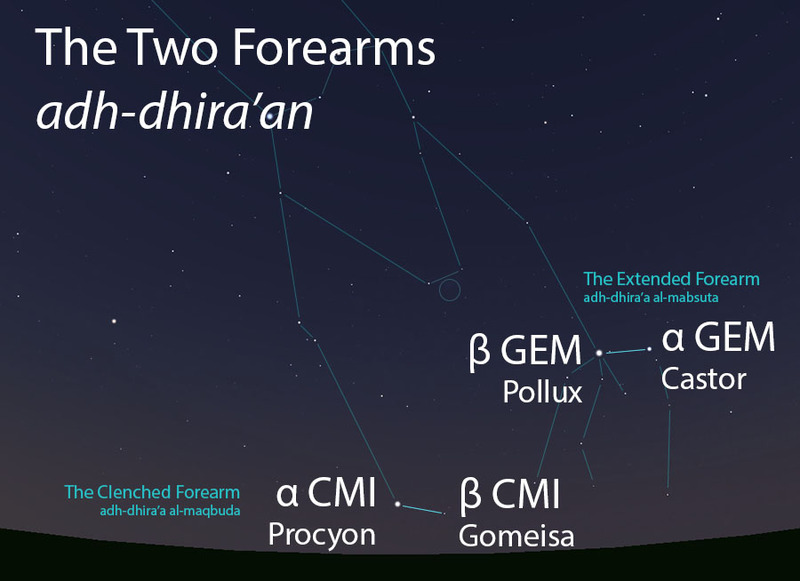 The Two Forearms (adh-dhira’an) as they appear setting in the west about 45 minutes before sunrise in early January. Sky simulations made with Stellarium. Two bright pairs of stars that are roughly parallel to each other. The space between each pair of stars is nearly the same. In the calendars of Qushayr and Qays, the morning settings of the Two Forearms occur during the cold winter season called ash-shita’. Although the ecliptic (the path of the Moon against the stellar background) passes more or less right between the two pairs of stars that made up the Two Forearms, the Moon comes somewhat closer to the Extended Forearm, and so within the context of the lunar stations only it, and not the Clenched Forearm, had the honor of being a lunar station. In early listings of the lunar stations, the Extended Forearm is the ninth station of the year. This was later changed to the seventh lunar station after the stations were adjusted to begin with the vernal equinox. The Two Forearms are part of the Lion (al-asad, الأسد) folkloric celestial complex, which extends from these Two Forearms to the Two Shanks (as-saqan, الساقان).